When certain activists and "progressives" prattle on and on about how "compassionate" they are, and how committed to "justice" they are, and how ever-so-tolerant they are . . . you know bigotry and hatred lie just around the corner. A few years ago, a guy from Miami decided to volunteer in India for the Missionaries of Charity -- the order founded by the late Mother Teresa, now Blessed Teresa of Calcutta and just a step away from sainthood in the Catholic Church. Apparently, Cuban emigré Hemley Gonzalez didn't like what he saw of the sisters' operations there; he founded a group he calls "STOP The Missionaries of Charity." From what I can gather at the group's Facebook page, Gonzalez thinks the Missionaries don't do enough for the poor and sick. He thinks destitute Indians who could be saved are, instead, dying in the sisters' care. 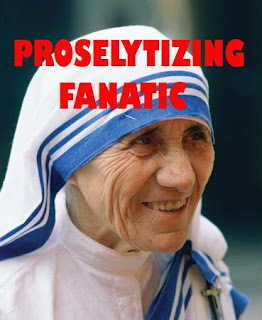 He and like-minded advocates of "tolerance" think the poor of India must be saved from "proselytizing fanatics" who believe in redemptive suffering. 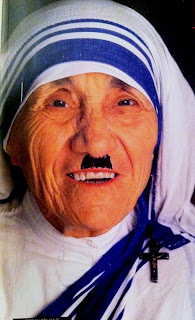 IT'S FAIR ENOUGH to raise questions about the dealings and practices of the Missionaries of Charity after Mother Teresa's death almost 14 years ago. But that's not what this bunch of bigots is about. When you're posting pictures of a beloved Catholic nun -- one who may yet become a recognized saint in the church -- with a Hitler mustache drawn on her face, that's not "compassion." That's not "concern for the poor." That's not "tolerance." And that certainly is not about love of anyone. What it is . . . is hate. Bigotry. Defamation. Hemley Gonzalez and his fellow travelers aren't about love of the poor. They're about hatred of the Catholic Church, religious charities in general and perhaps God Himself. The idea that religious charities are doing amazing work is a fallacy. They often care for others to convert them to their dogma first and their compassion comes second if ever at all. YOU CERTAINLY can't say that Gonzalez isn't all about unencumbered tenderness (unless, of course, you happen to have a dogma he and his find offensive -- then you get done up as Hitler or get nasty slogans thrown at you). And you certainly can't say he and his aren't all about talking about alleviating suffering. According to his Facebook profile, Gonzalez' "personal interests" involve "Achieving the end of suffering for all sentient beings." With a smiley emoticon for good measure. "But they, the doctors, were good fellows and they had their reasons. "The reasons were quite plausible. "I observed some of you. "But do you know what you are doing? "I observe a benevolent feeling here. "At the bedside of some children this morning I observed you shed tears. On television. "Do you know where tenderness leads?" "Tenderness leads to the gas chamber." . . .
"Never in the history of the world have there been so many civilized tenderhearted souls as have lived in this century. "Never in the history of the world have so many people been killed. "More people have been killed in this century by tenderhearted souls than by cruel barbarians in all other centuries put together." "My brothers, let me tell you where tenderness leads." "To the gas chambers! On with the jets!" Dammit, Fave! Stop that! You keep writing the kind of posts I'M supposed to be writing!